Math test scores soar if students are given the chance to struggle. New Jersey teachers have found a surprising way to keep students engaged and successful: They let underachieving youngsters get frustrated by math. While working with minority and low-income students at low-performing schools in Newark for the past seven years, researchers at Rutgers University have found that allowing students to struggle with challenging math problems can lead to dramatically improved achievement and test scores. "We've found there is a healthy amount of frustration that's productive; there is a satisfaction after having struggled with it," says Roberta Schorr, associate professor in Rutgers University at Newark's Urban Education Department. Her group has also found that, though conventional wisdom says certain abilities are innate, a lot of kids' talents and capabilities go unnoticed unless they are effectively challenged; the key is to do it in a nurturing environment. "Most of the literature describes student engagement and motivation as having to do with their attitudes about math -- whether they like it or not," Schorr says. "That's different from the engagement we've found. When students are working on conceptually complex problems in a supportive environment, they do better. They report feeling frustrated, but also satisfaction, pride and a willingness to work harder next time." Former Newark middle school math teacher Debra Joseph-Charles says the Rutgers training taught her to see her role as that of a guide. In her classes, she assigned rich word problems, then gave students a few minutes to work individually in a way that emphasized their strengths. "If you are good at computations and you want to do it that way, you can," says Joseph-Charles, now a math coach in the school district. "If you are a visual learner and you want to draw, you can. Or if you want to use manipulatives, you can. 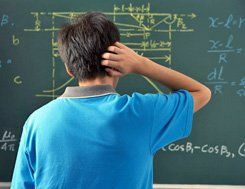 You hear this rhetoric about there being this and that type of learner, but no one really gives students the opportunity to learn in different ways in the math classroom." Using the Rutgers method of group learning, Joseph-Charles's students organized themselves into groups so that each student could explain how she arrived at an answer. The other students in the group gave constructive criticism about the pros and cons of each approach. Each group then decided which method was best and presented it to the class. "Children who were failing are now quite successful," Joseph-Charles says of her former math students. "They're solving problems in ways we didn't see as a possibility but which were valid." Naga Madhuri Philkhana, another former teacher turned math coach in Newark, says the Rutgers approach gave her students a sense of accomplishment. "You bring out their confidence by letting them have their own way of looking at problems and sharing it in the classroom," she says. After teachers like Joseph-Charles and Philkhana began applying the Rutgers techniques in the classroom, students showed more interest in math, and the math test scores at what were among the lowest-performing schools in the state began to soar. (In comparison, the language arts scores often remained the same or decreased.) Schorr was delighted but admits she was also surprised at the rising scores and how they have continued to improve year after year. Since 2003, the average standardized math test scores among fourth graders in Newark schools have risen from 45 percent to 79 percent. As a result of its success, math teachers across New Jersey are now receiving professional development in the Rutgers method through a federally funded series of webinars called MathNext. Schorr and her colleagues at Rutgers, with the help of MetroMath researchers in New York City, have begun identifying how and when students appear to be most engaged in math so they can train teachers to create and sustain that engagement. A number of their academic-journal articles on the subject have been published, and more are forthcoming. "Motivation is a key aspect of achievement that we often ignore in math; it's the missing link," Schorr says. "We need to provide kids with conceptually challenging math problems in an emotionally safe environment, and the teacher plays a critical role in that. Kids can view frustration as an opportunity for success instead of an indication of failure, but that won't happen without teachers letting the students experience productive struggles." Bernice Yeung is a contributing editor for Edutopia.